Our pirate candy bar wrappers add a fun pirate feel with a skull and sword on a vintage background. 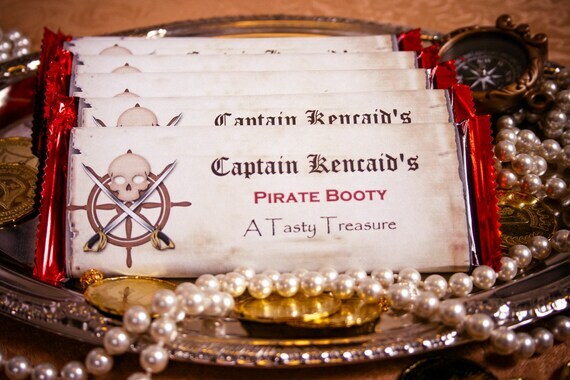 Add your own text to these great pirate favors. These pirate candy wrappers fit full size chocolate bars. Download, print & cut them and secure them with tape or glue to your full size Hershey's candy bars. * READ ENTIRE LISTING BEFORE PURCHASE! *This listing is for 2 full size pirate candy bar wrappers in digital format. *No hard copy will be shipped. Tip: Wrap the bars in gold or silver foil first for an extra special touch. THIS IS A DIGITAL FILE LISTING No shipping required. * Background and graphics are not changeable only text. 1. Scroll to the top of the Etsy site and hover over "Your Account"
2. Click on "Purchases & Reviews"
If you do not have Adobe Reader you can get a copy at the link below. Text can be changed only. 8.5 x 11 inch sheet. ~Print as many as you need from home or from a shop with print services. ~PERSONAL or NON PROFIT use only. ~You may not sell, redistribute, reproduce or share these files.